What is the Recommended Dosage for Grape Seed Extract? The seed of the grape contains particularly rich stores of oligomeric proanthocyanidins complexes, a group of compounds that have been identified as having strong antioxidant properties. According to the University of Maryland Medical Center, "good evidence" exists to suggest this supplement can help relieve symptoms of chronic venous insufficiency -- a condition where the veins in your leg cannot efficiently carry blood back to the heart. It has also been touted to treat and prevent conditions ranging from heart disease to cancer, though not enough evidence exists to conclusively determine if it works for those purposes. Some dosage guidelines have been suggested for this supplement, but you should consult a physician well-versed in natural medicine for guidance on an appropriate dosage for your condition as well as other aspects of safe and effective usage. According to Drugs.com, a standard dose of grape seed consists of 50 milligrams to 300 milligrams daily. In some instances, it reports doses of 900 milligrams have been used in studies. The University of Pittsburgh Medical Center reports a suggested dose of 50 milligrams of OPCs daily of grape seed for general antioxidant support. The University of Maryland Medical Center notes the following dosage suggestions: 25 to 150 milligrams daily for general antioxidant support and 150 to 300 milligrams daily for chronic venous insufficiency. Just like pharmaceutical drugs, natural supplements typically need to contain a minimum amount of the primary active components to achieve any therapeutic benefit. Look for standardized grape seed extracts that contain at least 40 to 80 percent proanthocyanidins. The UMMC reports that the suggested dosages have been established as safe up to 12 weeks, meaning that whether this supplement poses any risks for longer-term use has not been established. No official medication interactions have been reported in scientific literature. Because grape seed might possess anti-coagulant properties, using it at the same time as warfarin or other blood-thinning medications could increase the risk of bleeding. 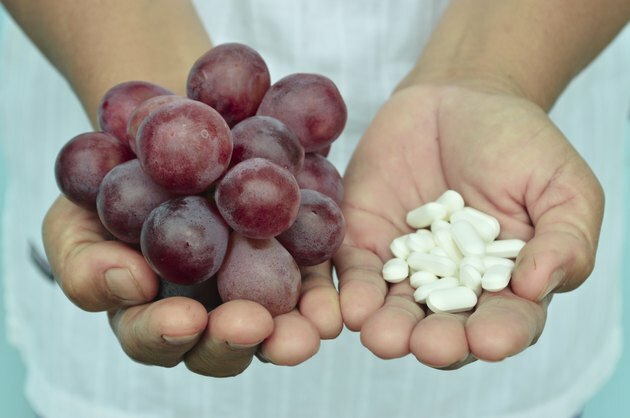 You should always clear the use of supplements with your doctor when you take any sort of medication as grape seed extract can interact with treatments just like prescription drugs. The University of Pittsburgh Medical Center reports one study found simultaneous use of grape seed and vitamin C raised blood pressure in patients already suffering from hypertension. Safe use during pregnancy or lactation has not been established. If you suffer from any condition that affects your liver or kidneys, you should not use any supplement without talking to your doctor first. Grape seed does not appear to pose any toxicity risks, and mild side effects might include stomach upset.